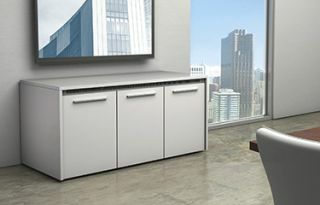 Middle Atlantic Productshas expanded its C5 Series Credenza offering to address the latest trends in commercial interior design. With new styles, furniture finishes, and options that reflect current design trends, the C5 Series was enhanced to help AV integrators work with the architect and design community to better integrate technology in modern spaces. Three new styles were designed to appeal to a range of design aesthetics. New finishes for the C5 Series include veneer and high-pressure laminate – all available in a spectrum of color choices. Vent finishes are now an option as well, in four different colors.